E-commerce sales continue to skyrocket as more people skip going to the store in favor of shopping from the comfort of their couches. According to census data, retail e-commerce sales totaled $87.5 billion in the third quarter of 2015 on a seasonally adjusted basis, a 15.1 percent increase from the same period last year. The right combination of tools that make the online shopping experience easy and fun for your end customer and management simple for you is key to scaling e-commerce. Whether you sell car parts or software, a great e-commerce experience is a prerequisite for doing business. Customers expect your site to be attractive, intuitive and easy to use — and with competition fiercer than ever, dissatisfied shoppers will quickly hop to the next retailer’s site. 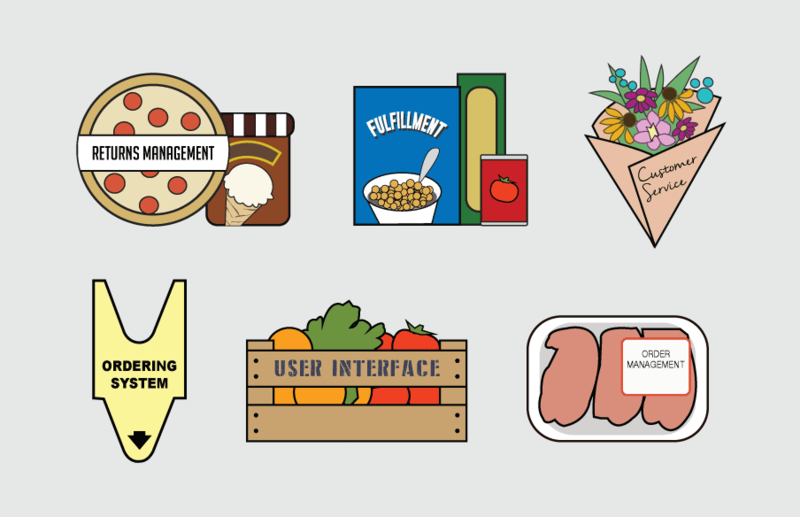 Like a great recipe, the e-commerce tech stack requires a sprinkle of just the right ingredients to work for you and your customer. Delivering an experience that keeps customers coming back requires the right e-commerce tools, like great ingredients for a fantastic meal. Sourcing the best ingredients can be overwhelming. Not sure where to start? Over the next week we’ll share what you need on your e-commerce shopping list. There’s a reason the first thing you see in a grocery store is neatly stacked fruits and vegetables in a beautiful array of colors. Juicy oranges, bright red tomatoes and bunches of dark green kale draw your attention and guide you through the entryway. Choosing items from this healthy rainbow helps you associate the rest of the store with freshness, bright colors and a pleasing layout. To create a similar aesthetic on your e-commerce site, invest in the right user interface tools. A well-designed e-commerce platform is the backbone of your online storefront, allowing you to lay out your products in an organized and attractive way. Digital signage lets your customers know they’re in the right place — and makes your site look as good as a freshly polished apple. Need a pound of Swiss? Some thinly shaved ham? Grab a ticket, because you’re at the deli counter. With a new number flashing on the screen every few seconds, this section of the store has to process orders quickly and accurately to stay afloat. Likewise, you need the right ordering system tools to keep customers moving smoothly through your e-commerce site. Catalog management software displays your products intuitively and beautifully online and in print, making them as hard to resist as prosciutto di Parma. Meanwhile, shopping cart and payment gateway tools facilitate the buying process and ensure customers don’t get stuck waiting in a deli line three people deep. Stay tuned next week as we continue to share how to create your e-commerce shopping list.